Our county fair was last week. It's always a VERY hectic week since I not only enter photos and show my goats, but also work at the fair. Although I have a good time, I am glad it's over. The photo? 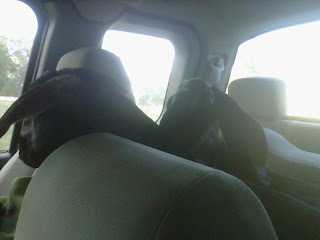 Yes, I really do take my goats to the fair in the back seat of my truck. Treasure is on the left, with Eve behind her. Lark, one of this spring's kids, was lying down and isn't in the photo. I apologize for the poor quality of the photo, I just grabbed it quickly with my cell phone.